I LOVE to be organized. Like full on color-coded, sticky note crazy, everything is labeled... mildly OCD. Organization helps me to keep my crazy life straight and everything ready to go. The more stressed out I get, the more organized I want to be... it brings me peace. 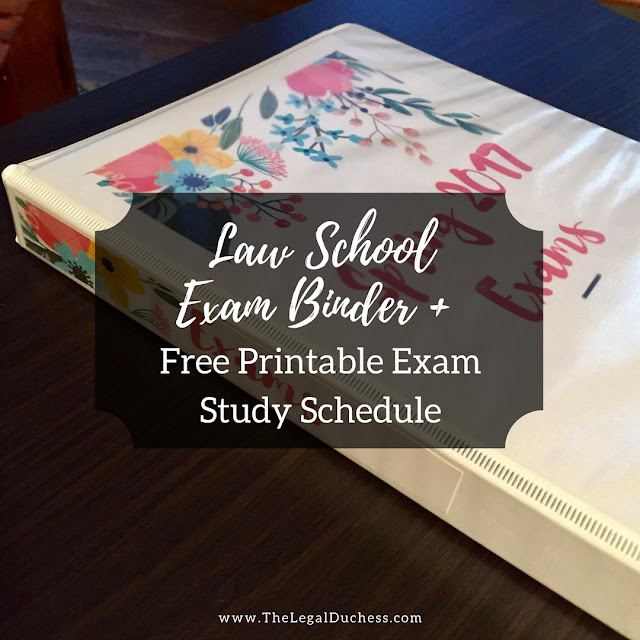 Therefore, exam time in law school requires me to be super organized or it just stresses me out even more than the exams already do. My key to organization during exams? My trusty exam binder! 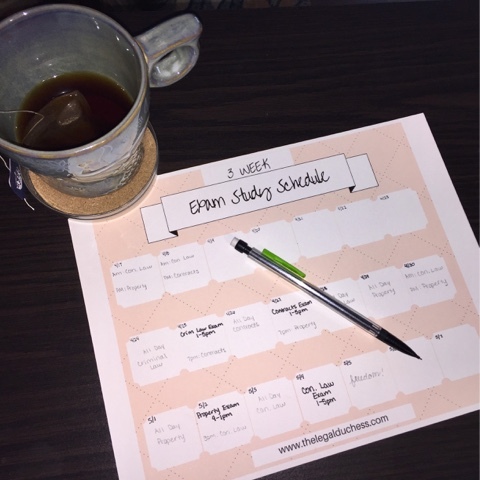 I started making my exam binder and study schedule for spring exams tonight and I thought I would share the process with my readers! I started making it already so I have a collection spot for the exam materials I am starting to pull together in these last few weeks before exams. Why an exam binder you might ask? Well, during exams I carry all kinds of crap- computer, books, flashcards, snacks, a blanket, legal pads, supplement study guides, water bottles, coffee cups, pens, highlighters, pencils, markers, headphones... that's not even all of it but it's a start. Basically, I become a crazy bag lady carrying all kinds of random stuff. If I had to carry all my usual notebooks and binders, it would just be too much. Therefore, I put all my outlines, study info, notes, attack outlines, cheat sheets, etc. in one nice, neat binder. This way, no matter where I go and what I intend to study, I have everything I need in one easy spot. What is inside my exam binder? I have a schedule of all my exams with location and times in the very front. This way I know where I need to be and when at all times. A detailed study schedule from the week before exams through the end of what my goals are for each day and what to study. Within each section, I have the relevant outlines, study guides, notes, practice exam prompts, rule statements, a baggie of flashcards, etc. Also, I like to make my binder pretty. I know it may seem silly but the bright colors and pretty flowers make me smile and I will take all the smiles I can get during finals week. The more aesthetically pleasing, the easier it is for me to stare at it for 8 hours a day. How do I use it to study? Studying out of my binder is easy. I just open to the necessary section and get to work. 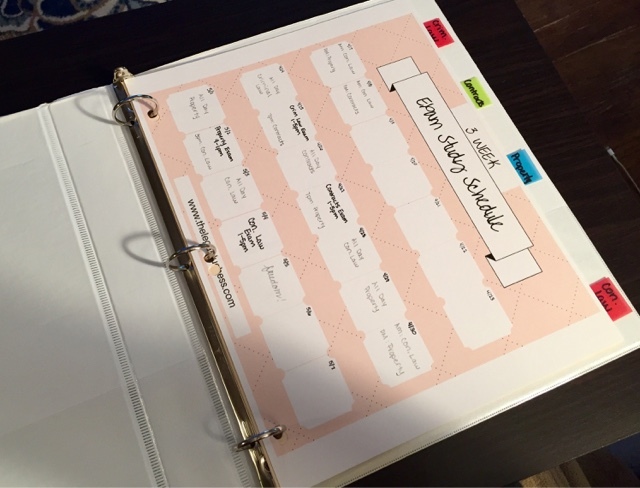 I can move things in/out of the binder and physically put my hands on the stuff, write on it, highlight, etc. Personally, I cannot study well from a computer screen- I know many people can but I am not one of them. Therefore, I like to have everything printed out and ready to go (I know I am not very eco-friendly but it is what it is). Keeping all these printed papers organized in the binder lessens my possibility of losing them or getting them out of order. Also, having organized study materials makes it easier for me to focus. Clutter and disorganization are major distractions for my mildly OCD mind. I find myself organizing and cleaning instead of studying. Therefore, if I start the studying process organized and keep it organized, I will remain more focused throughout and I study much better that way. My binder is key to organized studying. What do I do after I complete an exam? I remove that section and add all those study materials to a file folder in my filing cabinet for later use when I study for the bar. 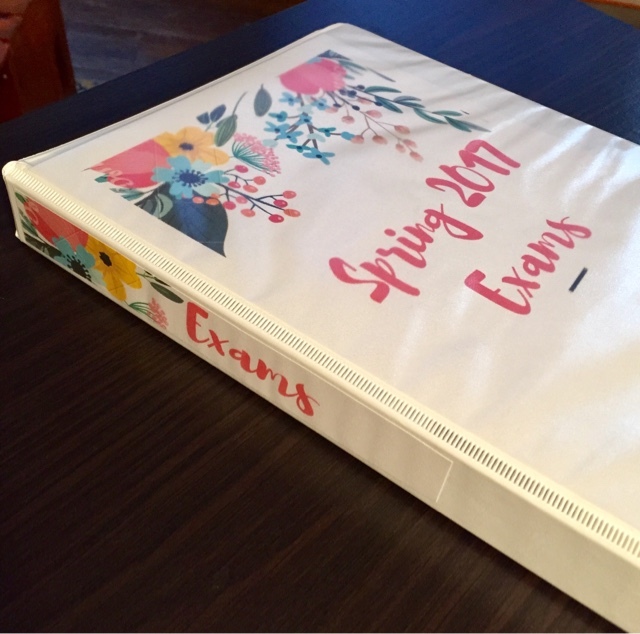 I find that mentally, the act of watching the material within my exam binder shrink as I complete exams, helps me to feel like I am nearing the finish line. It helps to relieve stress but removing those classes from my immediate thoughts and materials. This helps me to focus on the upcoming exams instead of fixating on the ones of I have completed and checking to see if I got things right/wrong- once the exam is over it is best to just put it out of my mind and focus on whats next. Physically removing the study materials from my binder helps me to mentally put that out of my mind. I work best when I have written out what I need to do. Therefore, I am a big fan of making study schedules; especially when I have 4 law school exams to prepare for. I like to have a 3-week schedule starting the week before exams- this way I can allocate my time and what to study. This keeps me from just waking up and wandering around my house trying to decide where to start (I am really good at using that as a way to procrastinate). Instead, I just get up and consult my schedule and get to work! Here is the link if you would like to print out and use my pretty little 3-week exam study schedule sheet yourself! This is certainly not the method everyone uses and I do not think it will work for everyone. However, I think it is a good starting point for first semester exams and a great way to keep yourself organized throughout the madness and stress of law school finals.